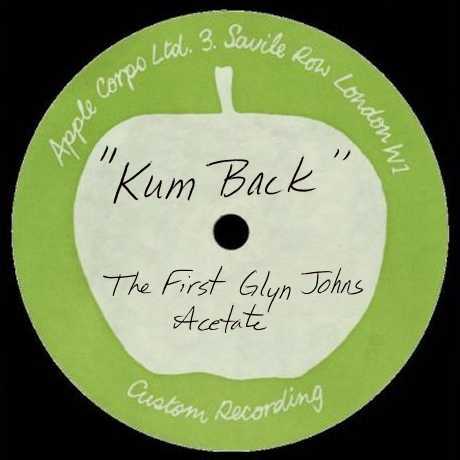 THE SOURCE - "Kum Back"
It has been commonly believed that Beatles' producer, Glyn Johns made his first mixes of the Get Back material 10 March 1969. However, the evidence was right before us that he actually did the mixes during the latter part of the Get Back sessions in January 1969. See the March date in "Recording Sessions" and "Chronicle" (Lewisohn) for description of this mixing sessions. The acetate was probably cut late 28 January or early 29 January, 1969. Many of these performances (with new mixes) were, subsequently chosen for all versions of the "Get Back" LP. Note that Barrett does not list 10 and 12 March 1969 as does Lewisohn. I have also noted Doug Sulpy's DDSI identifacation numbers. The mixes used on the acetate are in green text. A playback of this reel can be heard on Nagra reels 453-454A. The acetate appears to include all the audio from this reel. A playback of this portion of the reel can be heard on Nagra reel 502A. (Lewisohn seems to indicate these two performances are mixed here. Barrett does not list them. A playback of this portion of the reel can be heard on Nagra reel 1113B. According to Beatle folklore, promotional copies of their unreleased 1969 Get Back LP were distributed or leaked to radio stations in the United States. In fact, no promotional copies of the album were issued . See a well done bootleg frabrication - here. Some stations (such as WBKW in Buffalo, and WEBN in Cincinnati) aired an undocumented mix of Get Back (available only on O.P.D. ), which mirrors the "final" tracklisting of the LP as documented in The Beatles: Recording Sessions. A second source for the Get Back material was an earlier reference acetate prepared by Glyn Johns on 28 January or 29 January. This was also aired by a number of American stations, including WBAI in New York, KXOK AM in St. Louis, and WBCN in Boston (which is the source featured here). Legend also has it that John Lennon, himself, leaked this acetate to the public on a trip to the U.S. in late summer 1969. Allegedly, this was a trade for some unreleased Beatles recordings that he didn't have. However, this has yet to see any real verification. The recording is significantly different than the "final" mix, which is widely available on various illicit records. It's noticeably less processed than Glyn's subsequent mixes both in terms of editing and the use of reverb. It also includes an extra performance of "Get Back" and a cover of Jimmy McCracklin's "The Walk." What's noticeable here, though, is that this is far and away the best sounding tape of this material you're ever likely to hear. WBCN obtained a reel-to-reel tape of the actual reference acetate. Their broadcast of this was preserved on another high-quality reel, and a digital copy of that tape was used to master the available bootlegs. The recordings have since circulated from that reel recording of the broadcast on WBCN Boston on 22 September 1969. A review of the recordings was even featured in "Rolling Stone" magazine. Recently, an August 1969 broadcast surfaced that originates from a WKBW Buffalo, NY broadcast. That broadcast is mentioned in the WBCN broadcast. However, it appears to feature a different track list (I haven't heard it yet). See that CDR release - here. You might note that I have chosen to place "The Long And Winding Road" at the beginning of side two when it has been typically placed at the end of side 1. John Winn also notes this as the placement. This placement makes more sence. First, you can hear the end of side one after "I've Got A Feeling" and the beginning of side two just before "The Long And Winding Road. The running time is better balanced this way. Second, side two is probably a straight copy of reel E69739. The DJ's statement implies that "Let It Be" is the start of side 2. Since the station is playing a tape of the acetate and not the actual acetate, perhaps "The Long And Winding Road" is at the end of side A on their reel. A third known recorded broadcast of the song "Let It Be" [22.74] from this acetate was aired by CKLW Winsor/Detroit in December 1969. A recording and story of that broadcast can be found - here. A recording also exists of most of "Two Of Us" as it was aired on WMMS Cleveland sometime in 1970. Although, this is announced as "...from Kum Back". By the end of 1969, the recordings turned up on The Beatles' first bootleg release titled Kum Back and have been a staple in The Beatles' bootleg canon for the past 35 years. Apparently, no photos of the acetate seem to exist and it is not commonly known where the acetate is today. 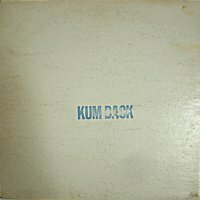 Please note that the label pictured here is not authentic and "Kum Back" is merely a name commonly dubbed to this set of recordings due to the original bootleg release of that title. The tracks featured here are taken from Vigotone's "Posters, Inscense, and Strobe Candles" which includes the entire WBCN broadcast. However, as featured here at TheBeatleSource, the DJ dialogue has been edited out to represent the acetate as a unit. Most of the broadcast can also be heard (with noise reduction) on Yellow Dog's "The WBCN Get Back Reference Acetate". NOTE: the first half second of "Get Back" on side 1 required some digital trickery to eliminate DJ dialogue. A half second of surface noise was taken from elsewhere on the disc and the first quarter second of the song was taken from "Get Back: John Barrett's Reel" JB-03001. This was all edited in to make the performance complete.